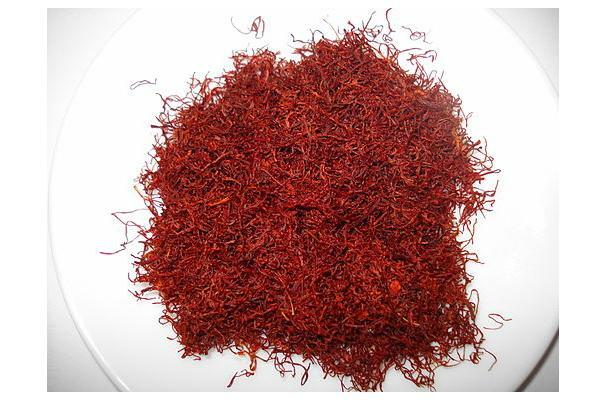 Production and Price: Saffron production is very labor intensive.. A pound of dry saffron (0.45 kg) requires 50,000–75,000 flowers, the equivalent of a football field's area of cultivation. Some forty hours of labor are needed to pick 150,000 flowers. Upon extraction, stigmas are dried quickly and (preferably) sealed in airtight containers. All of which makes Saffron extremely expensive, costing as much as $1000 per pound. Luckily a little goes a long way. Usually sold dried in long thin threads. Sometimes available in a powdered form. Choosing: Look for saffron that has a strong aroma, it should be something you can smell through plastic. Beware of artificial or imitation saffron, it is often little more than yellow food coloring and salt. Buying: Although bulk saffron is often sold from small wooden boxes, it is best packaged in foil to protect from air and light. Available in threads (whole stigmas) and ground, your best bet is to go with the threads. Not only will they retain their flavor longer, but you will also be assured you have purchased pure saffron. Vivid crimson colouring, slight moistness, elasticity, recent harvest date, and lack of broken-off thread debris are all traits of fresh saffron. Powdered saffron is not as strong, tends to lose flavor, and is also easily adulterated with fillers and imitations. Since so little is needed, you will find ground saffron sold in packets of about 1/16 of a teaspoon, and threads equaling about 1/4 gram or 1/2 of a teaspoon. Since heat releases saffron's flavor essence, the best way to extract flavour from saffron is to soak the threads in a small amount of hot (not boiling) liquid for 5 to 20 minutes (there are those that contend that a minimum of two hours soaking is necessary to properly disperse aroma, flavor and color). Then add both the saffron and the liquid to the recipe. Saffron threads can be soaked in water, stock, wine or milk. Just make sure that all the saffron threads are immersed, without crushing. Store saffron in an airtight container in a cool, dark place for up to six months for maximum flavor. Saffron, like other herbs and spices, is sensitive to light, so wrap the packet in foil to protect it further. It will not spoil, but it will lose increasingly more and more of its flavor with age. Iran ranks first in the world production of saffron, with more than 94 percent of the world yield. History: The word saffron derives from the Arab word zafaran, meaning yellow. This spice, a product of the crocus flower that is almost literally worth it’s weight in gold, is native to Asia Minor, where it has been cultivated for thousands of years to be used in medicines, perfumes, dyes etc. It adds, not only a aromatic flavor to foods, but also a beautiful golden color, and is widely used in Iranian (Persian), Arab, Central Asian, European, Indian, Turkish, Moroccan and Cornish cuisines. For example saffron is one of the three essential ingredients in the Spanish paella valenciana, responsible for its characteristic brilliant yellow colouring.